Exclusive 12, 8, 5 or 3 Easy Payments on JBL EON615 Powered 15 Inch 2 Way Full Range Loudspeaker Pair Package only at AMS! Free 2 Day Shipping & Free Extended Warranty. Call our Gear Experts at 800-319-9043 for expert advice! 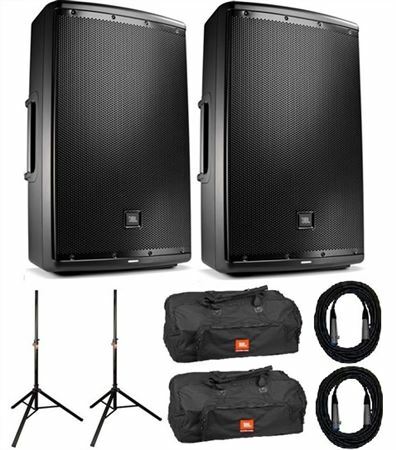 A powered PA speaker package that includes 2 JBL EON 615 speakers, 2 stands, 2 bags and 2 cables. Made of lightweight aluminum tubing, these strong and durable stands secure your speakers safely by way of the ergonomic “Z” knob for tightening the tripod legs and the locking pin mechanism for securing the telescoping tube. Their innovative Lift ring makes for an easy set up and their Hard Coat Anodized finish protects from the elements, ensuring years of trouble-free use. Protect your investment with the deluxe 600-D Nylon form fit carry bag. This water resistant bag features 10mm soft padding throughout and heavy-duty reinforced carry handles. The convenient external pocket is perfect for cables and accessories. I completely love my speakers !! My JBL’s work great an I had a great customer experience purchasing from this sight !! They were Helpful an honest !! As a new DJ. These speakers were everything I needed. Lightweight and easy to storage. Easy hookup and sounded great straight out of the box. I look forward to purchasing the subwoofers to take my system to the next level. No complaints on the speakers. I'm enjoying the new sound it gives. I love this thing, it is well worth the money. For the money I spent, I think this is a very good set. I don't just have 2ways great speakers but also bag and stands to protect them. This is something great. I say JBL has done it again and the EON Family had me thinking twice of the buy. When I saw the look of the speakers and powered them on, the sound clarity and all made it worth every penny. I bought the package everything is very durable and lightweight. Just an Awesome portable system. I use this speaker as two of four to supply audio to over 600 people. Well worth the money.